Originally published in 1995. 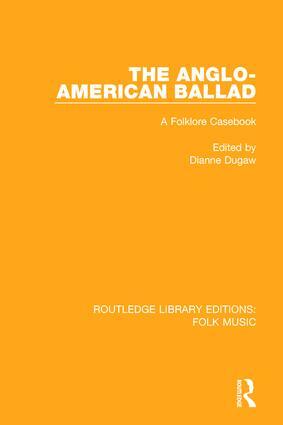 This book’s collection of key essays presents a coherent overview of touchstone statements and issues in the study of Anglo-American popular ballad traditions and suggests ways this panoramic view affords us a look at Euro-American scholarship’s questions, concerns and methods. The study of ballads in English began early in the eighteenth century with Joseph Addison’s discussions which marked the onset of an aesthetic and scholarly interest in popular traditions. Therefore the collection begins with him and then chronologically includes scholars whose views mark pivotal moments which taken together tell a story that does not emerge through an examination of the ballads themselves. The book addresses debates in tradition, orality, performance and community as well as national genealogies and connections to contexts. Each selected piece is pre-empted by an introductory section on its importance and relevance.